Check out the missing movies & documentaries on YouTube. municipal evil empire spreading like wild fire across our once free republic. 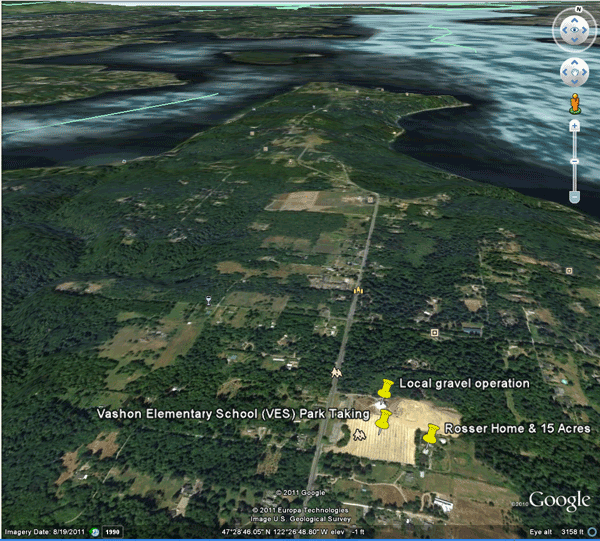 "We are titled private property owners since 1944, abutting the VPD Fields project here on Vashon-Maury Island. 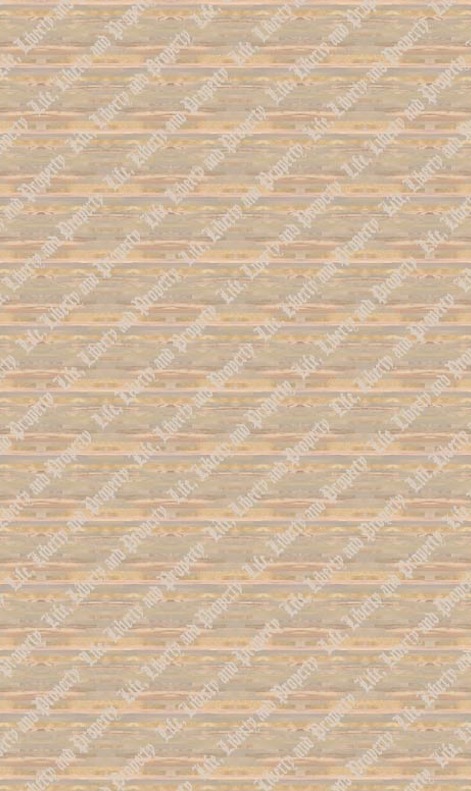 A number of activities have and are taking place regarding these fields that appear to be outside acceptable or lawful practices to many neighboring property owners and perhaps, represent a use of previous funding provided in a manner other than what the WARCO may wish to continue to endorse. We would be happy to visit with you to provide documentation or photos of above stated actions. We are sending some videos that have been made that give a brief example of VPD behaviors. Here are the links forwarded, should you or anyone at WARCO have an interest. We believe them worth the time to view, well done and informative." 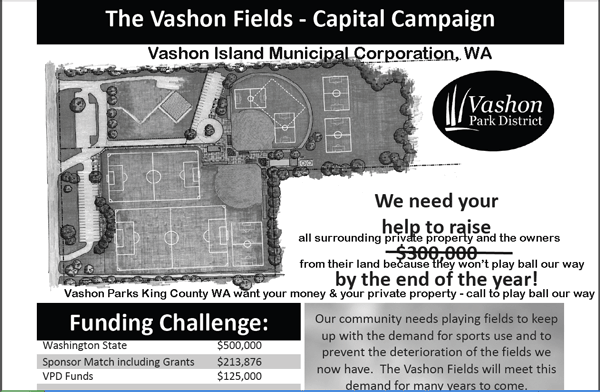 DO NOT "HELP" VASHON MUNICIPAL PARK DISTRICT TO TAKE MORE PROPERTY. If you have donated demand your money back. The municipalities (incorporated & unincorporated) (city, county, state or federal network) and all of THEIR cereal agencies are predatory and will do anything to destroy the surrounding property owners life, property and happiness. This includes jail time, bankruptcy, harassment for years, liening the private property and even the destruction of the marriage and employment of the family who challenges the taking. The government cereal agencies and their supporting non government groups target land they wish to take with no consciousness or compassion for the surrounding property and business owners. Why do they this, you ask, because they can get away with it. Government municipal agencies operate above the fundamental and founding laws of the land as does all levels of American government. The politicians and the lawyers create the legal fiction which can only be applied to those who create it. This is where the lie begins. In a true and honest free Republic, the natural born and rightfully naturalized, are free and sovereign. Local Citizens have divine rights of kings and queens. They are the creators of government including public and private corporations, not the servants. These divine rights have not been transferred to any government employee or public or private corporation employee by any combination of votes, political parties or man made legal fiction. These 68 some unalienable rights create a divine sanctuary around the home and all private property including family business property, which is inviolable, immutable, indisputable, unrestricted, unqualified and absolute. The process and mind set of parking out communities becomes more bizarre as most of the community will support the takings because they do not fully understand, and are intentionally not told, and are indoctrinated to believe eminent domain and force trump natural laws and natural rights. The collateral avalanche of destruction to the abutting and nearby surrounding property owners is unbelievable for most Citizens including most property owners UNTIL, they have gone through HELL and years of torture themselves at the hands of the state, then their eyes are open. Furthermore, very few local Citizens and certainly no government employees, fully understand the limits of their roles in a true and honest limited free Republic. If the state (government) could rightfully eminent domain, legislate, regulate, judicate or administrate by the proxy or bestowal of a majority local community or council agreement, they could take anything they targeted. Is this not true? Few to no property owners have the resources to fight even local government municipal takings because they are on the edge already in all dimensions. The "law" cannot be used to take property, only to defend it from being taken. We live in an era of progressive "law" or positivism, whereby "laws", regulations and codes are debased on prior similar cases. It takes little imagination to understand laws which are "progressive" are no laws at all, because they are NOT based on solid fundamental and founding laws of the land, i.e. the Laws of Nature and Natures God, the Declaration of Independence and the spirit, intent and success of the first American Revolution. Progressive laws, even if they were threaded to the fundamental and founding laws of the land, would quickly be debased for greed and power by the global to local politicians and lawyers and benefiting NG groups. This is a free Republic, as in individual free choice, no exceptions. In a free Republic, the natural born and rightfully naturalized Citizens are sovereign. There can only be one sovereign in the land and that is the rightful American Citizen. The only judge of a free Citizen is a fellow Citizens. Today's laws, codes, regulations, acts, legislation, progressive court decisions, administrative orders can ONLY be applied to those who made the laws. Only those who have agreed to this legal fiction can be forced to submit to it. American Citizens are not bound by man made laws and codes by adhesion for what they individually do not contract to perform. The government and their cereal agencies are NOT sovereign by any fundamental or founding charters. 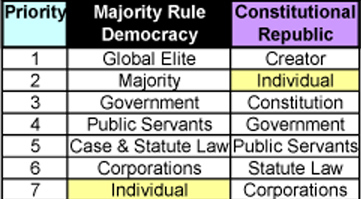 This sovereignty is not expressed nor transformed through a "majority" or "minority" vote of any group of Citizens,e.g. "representatives", "senators", "administrators" judges, councils, mayors, executives, local citizens boards, park department employees, etc. The united States of America congress only has authority over federal territories, military bases and ammo dumps. While the states are independent, they are bound through their constrictions to the U.S. Constitution and D.C. inc. The county and city municipalities, rural and urban and most especially the incorporated municipal are created and operate under the state constitutions as are the private corporations. This structure is a legal fiction hierarchy that is distinctly separate from the American natural born and rightfully naturalized. Constitutions are government bylaws which limit government NOT the American Citizen. The American Citizen have unlimited sovereign power. Are you beginning to see the "unbelievable" big picture of how Americans have been taken and held hostage and enslaved by municipal lies, larceny and fraud to name a few crimes plus violent crimes I will not go into here. If you can force parks or any other taking of property on sovereign Citizens for the good of the whole, then you believe you do not live in a true and honest free Republic. If you can force 20 some parks and recreation areas on sovereign Citizens on a small island of 10,000 Citizens including those who do not want them for any reason and cannot afford them and cannot afford to fight to not have them, of which the parks cannot pay for themselves nor cannot raise the private capital completely nor can the Vashon Park District or any district afford to pay their own employees but by stealing and extortion upon taxpayers who are near or into financial ruin, you can turn Vashon Island into a Stepford island of all parks and no business or homes. You could create a strictly recreational island for the Puget Sound. Vashon Park District can create an Island of Dr. Moreau. 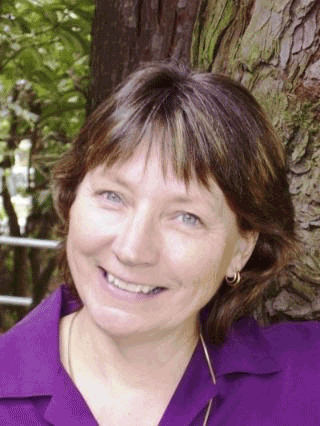 This is the dark side of a democracy, which most of Vashon Island Citizens think they live in. While in fact, we all live in a free Republic, where the individual Citizen and property owners are sovereign. You can transform a free Republic into a form of soft fascism over generations whereby few Citizens have a clue that all of their private and public property, unalienable rights, traditions, freedoms, liberty are taken. All while, they are transformed into slaves of forced labor working 24 x 7 for their park systems, funded by increasing debt, usury, regulations and forced tax extortion. Stepford towns, USA are forming all over America thanks to UN Agenda 21. Citizens including seniors are forced into menial jobs because manufacturing has been shipped abroad where it cheaper because of less overhead and less nonsense junk science and legal fiction. All of this taking merely so a few government employees (8%) and the parasitic non government employees can have more security and work less with fatter pensions than the private sector. Better said, all of these takings connect to the global to local elites and networks which are the Brotherhood of Darkness using the municipal network to do their dirty work. The great irony of this slavish belief system is, we do not need the public sector at all, as it is an anchor around the neck of the free market, the free Republic and the free Citizens. This type of public tyrannical municipal monopoly is designed to transfer and centralize individual divine rights and power to a few megalomaniacs in the municipalities who have more ego than humility, compassion and love for their fellow Citizens. The problem is easily stated. To use legal fiction by municipalities to extort and coerce American natural born and rightfully naturalized property owners to move over for parks is the equivalent of playing Russian Roulette. The solution is easy. Just privatize and coop the public sector and all these problems go away. Municipalities were created by American Citizens to share common community infrastructure utility costs through billing of shared services. The property or business owner would voluntarily pay for the service if they needed the service and if the service performed as contracted. Municipalities were never given rightful authority or power to expand themselves by the use of force into taking local American Citizens property, traditions or unalienable rights for any reason. The takings of property and destruction of community traditions by aggressive green extreme land use policy will continue as long as junk legislation, junk municipal regulations grow. Junk laws grow like cancer and are rarely repealed. Not unlike cancer, by the time you discover you have it, it too late to fight it. The organic way to fight cancer is to change the diet and life style. Muncipalities are on steriods plus eating poison and transforming the body of the community into cancer. Government tyranny can be nullified by changing the diet of steriods and poison, e.g. grants, taxes, usury, regulations, force, codes, courts, eminent domain, ad nausea, to privatizing and cooping the park districts into non profit organizations of primarily volunteer staff. $1.619 million annually for parks extorted from property owners, of which many if not most,do not want or need. 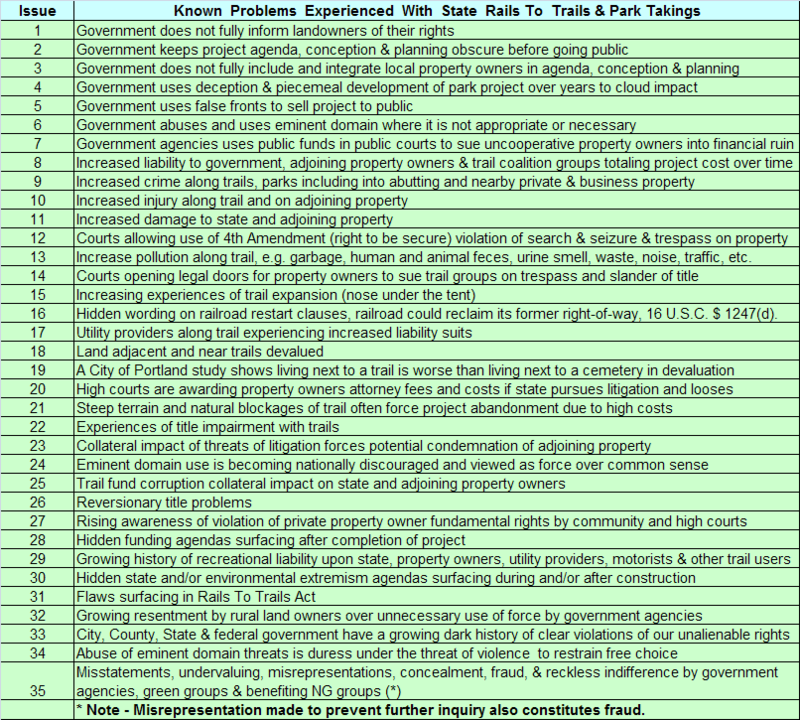 All parks should be privatized/cooped to get the overnment out of terrorizing & extorting local property owners. 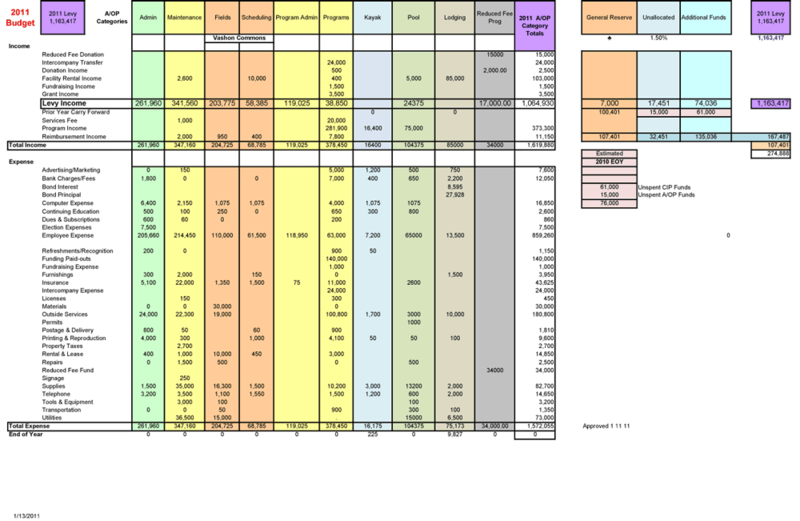 1.6 million dollars annual extortion (2011) to run a Park District for and AGAINST 10,624 Citizens on Vashon Island, Washington which could be privatized and run without tyranny of any kind. It is long past time to dismantle the public sector and transform this network of local to global Mafia into free choice private enterprises of coops and volunteer organizations. "King County allows this to proceed without permits for clearing on 292-303-9081 and no permits at all on file as far as I can find on DDES site for any kind of construction for 292-303-9081 or 202-303-9020. Go figure. However without filing for a permit and just going ahead and doing the project, they may have to file & pay fines later but the reward for them is no environmental impact statement nor time allotment for the neighbors to weigh in on the project as KC mandates on such a project. And I am being served papers 2 cut tansy on my property or be fined! Alas, use of tax dollars. Different departments." 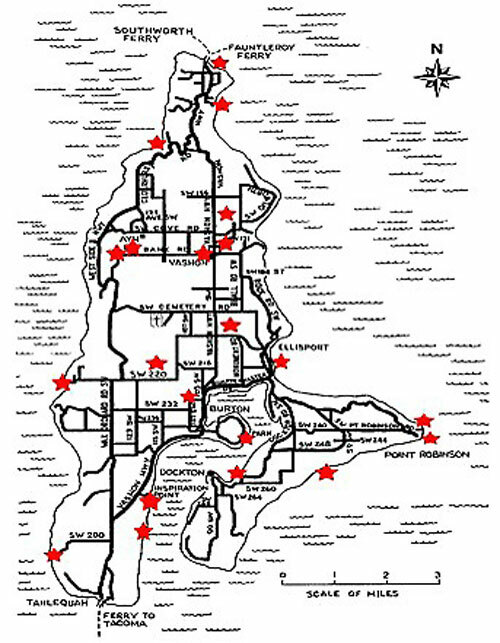 Stories Released To The Public regarding Rosser poperty takings by local Vashon Island, Washington state Park District funded by a grant of $650,000 for the "ambitious project." 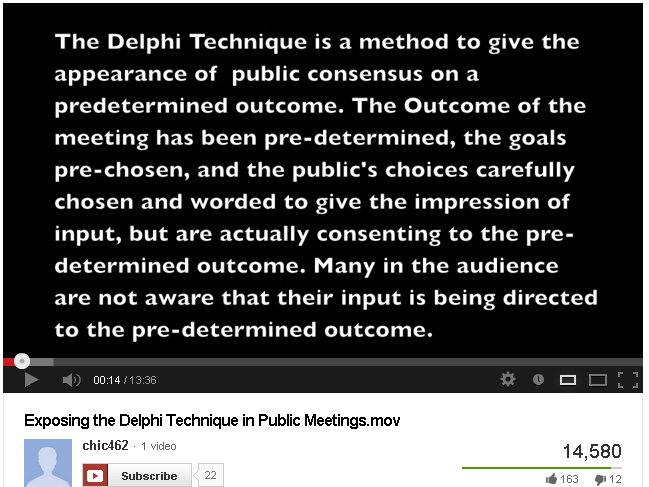 2013-04-08 The Rosser Propery Taking by Vashon Park Department - YouTube of Vashon Council Meeting Denying They Walked All Over the Family. info@vashonparkdistrict.org or call 206-463-9602. You can also leave written comments outside the Ober Park offices in the secure chrome drop-box left of the front door. legislation being passed due to terrorist incidents which are occuring today. The people who do not understand these things are simply being decieved and yet know it not. Vashon Island Parks Department Officials Killing You Softly With Kindness AND For Sport (fields). “I have a great sense of accomplishment when I reflect on my years with the district,” Braicks wrote, recalling how she’s seen the district evolve in the two decades since it began with her as its only employee. 18 parks, as well as several recreational facilities such as a pool and kayak center. " of it,” Hackett said". 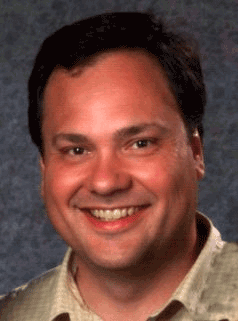 David Hackett is the commissioner of Vashon Island Park District. Hafer v. Melo, 502 U.S. 21 (1991)-Supreme Court held that state officials acting outside the color of law may be held personally liable for the injuries or torts they case and that official or sovereign immunity may not be asserted. "There may be times where the government does not intend to acquire property through condemnation, but the government action nonetheless has a significant impact on the value of property. 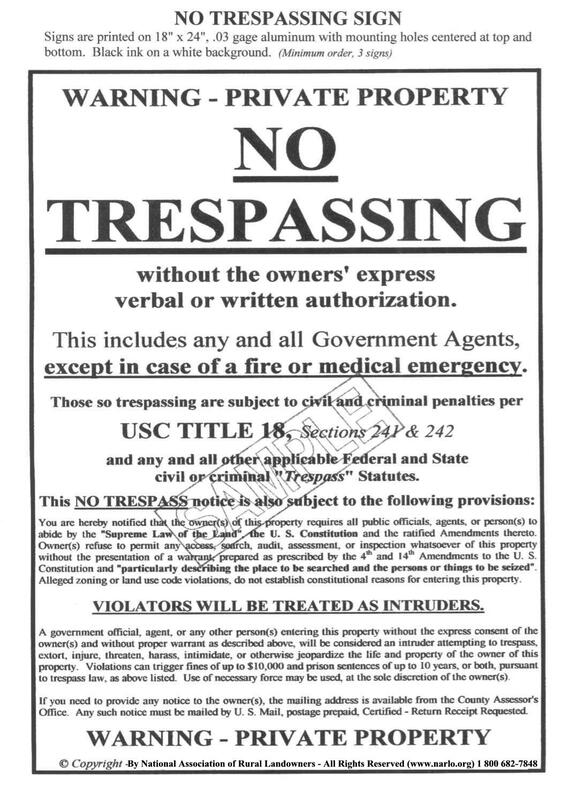 In some cases, the government may argue that its action has not taken or damaged private property, while the property owner argues that a taking has effectively occurred despite the fact that a formal condemnation process has not been instituted. 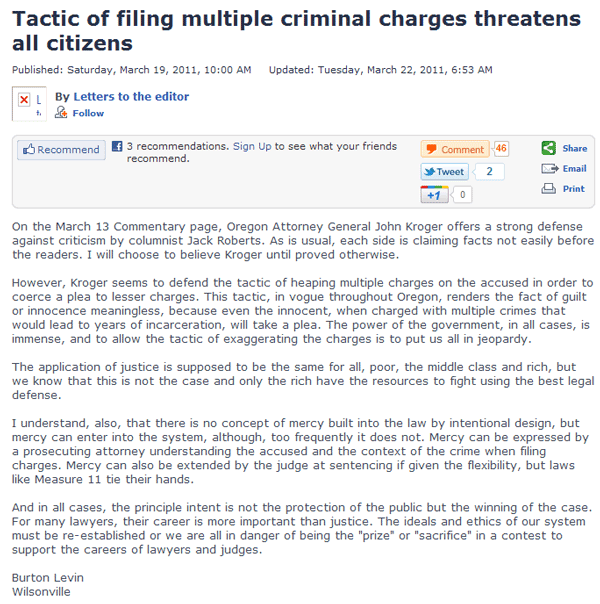 This dispute may lead to an “inverse condemnation” claim, and the filing of a lawsuit against the government, in which the court will determine whether the government’s actions have damaged or taken property. If a court determines that the government’s actions have effectively taken private property for some public purpose, it will award the payment of just compensation, together with the costs and attorneys fees associated with litigating that inverse condemnation claim. Inverse condemnation cases generally fall into two categories: those involving physical occupation or damage to property; and those involving the impacts of regulation on property. a. Physical Occupation or Damage. The government may be required to pay just compensation to private property owners whose land has been physically occupied or damaged by the government on a permanent or ongoing basis. For example, if the construction of a public road blocks access to an adjacent business resulting in a significant loss of business, the owner may be entitled to just compensation for “damage” to the property. " b. "Factors to Consider in a Substantive Due Process Analysis. Substantive due process principles require the government to ensure that its actions are reasonably designed to advance a legitimate state interest. To determine whether the government action is reasonable, a court will consider the relation between the government’s purpose and the burden on the landowner. To what extent does the landowner’s land contribute to the problem the government is attempting to solve? How far will the proposed regulation or action go toward solving the problem? A court will also want to know if less oppressive solutions are feasible." determine if that was a factor influencing the analysis. The National Association of Reversionary Property Owners (NARPO) is “a group of property owners who have joined together to educate all landowners in the United States about the true ownership of railroad, utility, road and other governmental types of Rights- Of-Way (ROW).” (http://home.earthlink.net/~dick156/row.htm) The group argues that groups, in particular rail-to-trail groups, are unconstitutionally taking abutting property ownership rights to abandoned right of ways. They argue that none of the rail trails have been beneficial for abutting property owners, and that some have disturbed property owners both emotionally and economically. NARPO is a very staunch opponent to trails programs. 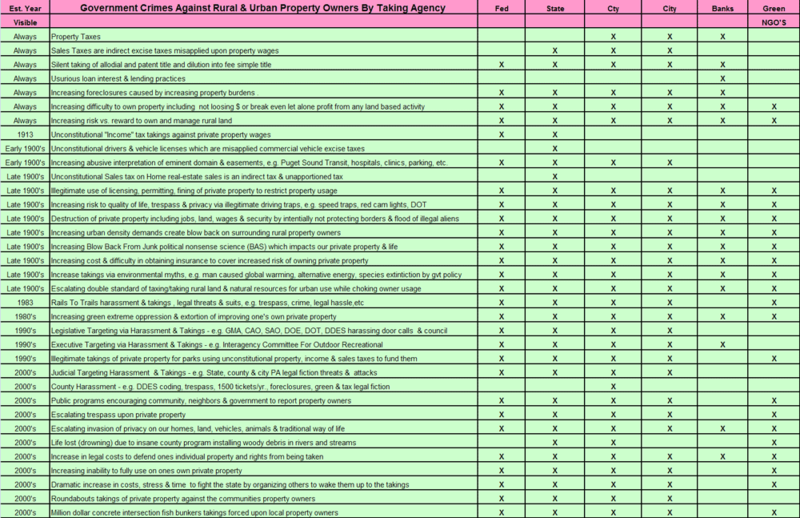 The NARPO web site brings attention to news and court decisions about property rights, references studies that show that owning land near or next to a trail or park devalues property, and includes a large list of references from the national news media that week by week site crimes in parks and on trails. The view one would get from this group is that all pedestrian trails are very dangerous and generally of no benefit except to about 1% or so of the population many of whom are deviants or perverts, or at least persons that should get exercise or outdoor exposure in another manner, and that the paths exist at the expense of endangered local populations and trampled property rights. NARPO studied the Burke-Gilman Trail and property values and refuted claims of a study done by the Seattle Engineering Department. The NARPO study focused on properties next to the trail and showed that property values along the trail corridor had declined or had not risen in value similar to what comparable properties had between 1979 and 1988. Between 1988 and 1997 the abutting, adjacent properties had increased by about 100% but this was not as much as the 140% increase sited for similar properties in the area. NARPO argues that the only reason for differences in figures was due to the presence of the trail. The co-authors of the study conclude that in Hamilton County, a home will devalue by $8,960 when moving away from the trail head by 1,000 feet. The relevance of the study could lie in what city planners do with the data. Parent argues that if property values go up near trails then property taxes collected will also go up. He believes there will be a measurable return on investment if a city builds this kind of infrastructure. "We have in mind doing more research going more into detail in terms of revenue generating through income taxes," said Parent. Parent was quick to point out that living nearer an access point was the key to the formula. "You will benefit from the trail (property value) if your house is close to a trail entrance through the street network," said Parent. Adjoining property values on rails to trails are severely impacted. The cities, counties and state refuse to address even this single issue of compensation. A 20 year study in Seattle, Washington on the conversion of a railroad Right Of Way to a trail showed that the 300 properties along the trail had only a 31% increase in land value in the 8 years that the trail had been in place. "Be ever mindful, throughout the twenty-four hours of the day, to apply yourselves to the study of the Unthinkable." Why Does Political Power Corrupt? Why Are Governments So Stupid? 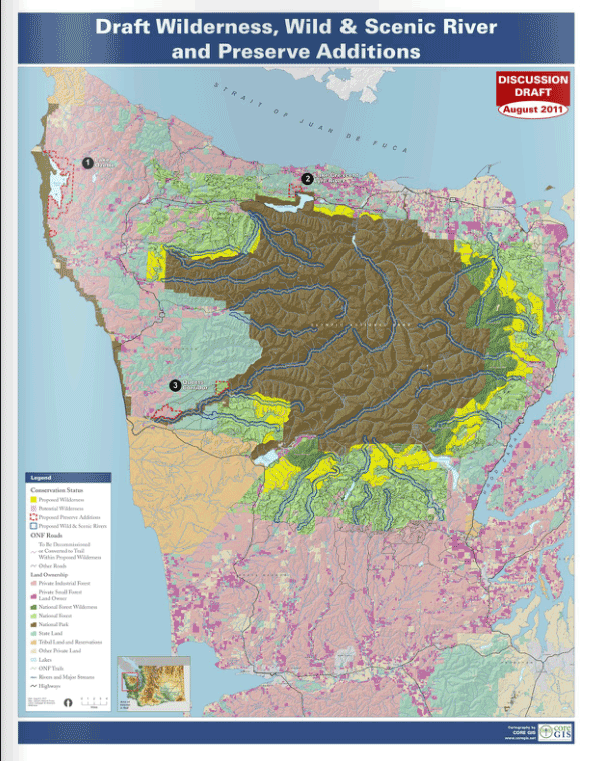 Here We Go Again - The Green Extreme Want An Olympic National Peninsula. So one question from one of more astute property owners is, what is going to happen to any structures on these proposed takings. 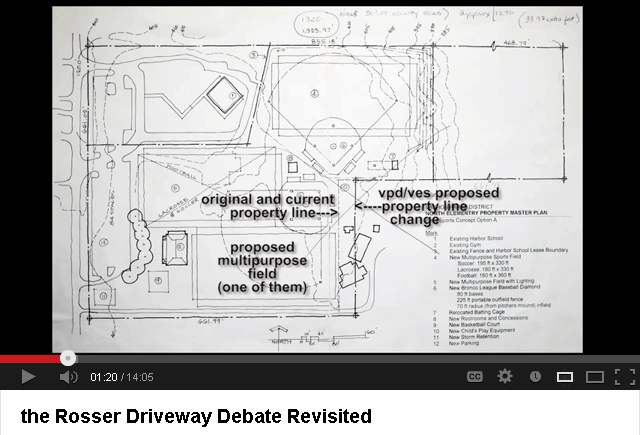 2011-05-25 The Nickolis and Charvilles have been engaged in years of litigation against Defendants over MetroParks’ attempt to establish a public bicycle and “leisure” path across their property on the former Milan Canal Corridor (the “Canal Corridor”).